From IBM to international trade and politics, for almost 120 years Grambling State University’s produced impact makers that helped drive some of the world’s most important change. And, this summer is no different. Two-time SGA President and Senior Liberal Arts and Visual Performing Arts major Adarian Williams is helping support major change on Capitol Hill. Interning for two of the most influential Senators in the 115th United States Congress, U.S. Majority Whip Steve Scalise and Senator Bill Cassidy, Williams helps support the work of a number of high-impact Senate Committees. From the historic and nationally known Blue Angels Air Show and Miss Louisiana Pageant to local events like Grambling State’s graduation, students from GSU’s TV Center are helping call and cue the shots for broadcast and web TV across the country. These GramFam interns range from sophomores to seniors in the school’s Department of Mass Communication which houses the TV Center and broadcast curriculum. Those students include Avia Knighten, Collin Jno’finn, Janet Jackson, LaNita Hughes, Nia Presley, Roosevelt Smith, Taneeshia Johnson, and Tayler Davis. In San Francisco, CA, Grambling State student and intern Kourtney Burney is working to help develop digital content for one of America’s largest media companies, ABC. Director of Media Relations for SGA and contributor to the Gramblinite, Kourtney’s campus-grown content skills are at work developing web, social media, and other content that reaches across the nation. Grambling State Sophomore, Tyree Burnett is one of ten HBCU students selected to work onsite with Coca-Cola Bottling Company UNITED, Inc’s division leaders. This July and August, Tyree will travel to work in Coca-Cola’s Baton Rouge offices and with the company’s Multicultural Consumers & Communities team. Junior and Computer Information Systems major Jarrid Richards is spending his summer working with one of Louisiana’s fastest-growing energy companies, CLECO. Headquartered in Pineville, LA, the company is working to diversify the sources of energy in Louisiana to create the most cost-effective energy resources in the state’s history. Since its founding in 1926, Nationwide has become much more than an insurance provider. Their footprint in insurance, banking, and investments spans the entire U.S. with a workforce of more than 32,000 employees. One Grambling State intern, Junior, Jalissa Purnell is helping support Nationwide and the team that’s recruiting their next generation of leader. Working in the Talent Acquisition and University Relations divisions, Jalissa is helping company leaders grow and create jobs across the country. Sophomore and Business Management/Marketing major Ashley Dabney is helping mentor and impact youth in her home state of Georgia this summer. As a staff member of the Georgia FFA-FCCLA she helps support a variety of youth camps and programs that educate youth on wildlife, safety, and team building. This summer Junior and Pre-Veterinary Biology major Dhara Richardson is working with some of the country’s leading Veterinary Scientists at Purdue University. As a summer research fellow, Dhara helps enter and analyze data to help fight rare diseases and find new applications for veterinary science. Mass Communications & Media Studies Junior Sara Renee Garner is working to help promote and expand access to early childcare and education programs in Dallas, TX. Through the non-profit Child Care Group, Sara is leveraging her media and marketing skills support outreach, event promotion, and the agency’s community relations efforts. It’s no surprise that these Grambling State students are “making big moves” this summer, getting the “real world” work experience the data says makes a difference. According to a 2018 Internship & Co-op Survey Report from the National Association of Colleges and Employers (NACE), the average job offer rate to interns is 59 percent. If you’re a current student in need of an internship, connect with the Office of Career Services today at (318) 274-2346. If you’re interested in hiring or sharing your internship with our team, email careerservices@gram.edu or visit our Office of Career Services online. 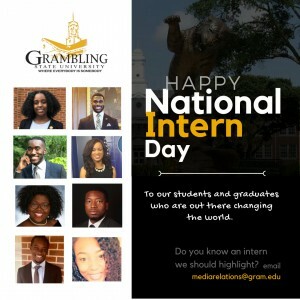 Do you know another #GramFam intern who is creating positive change? Share them with us. Email the interns name, classification, role and company information to mediarelations@gram.edu. This entry was posted in gramstory, staff, studentlife on July 26, 2018 by Jovan Hackley.